In memory of Paul Regina (Cliff, the gay brother)...he died at the young age of only 49 some years ago. 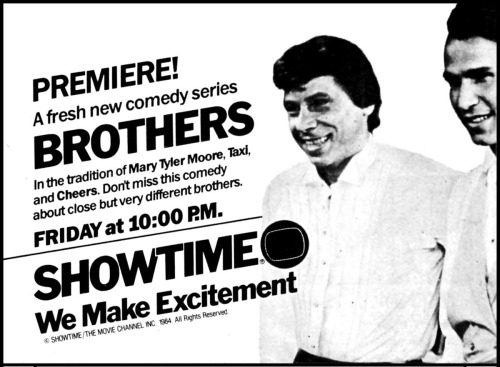 NOTE: Here are only 16 episodes of the rare and very funny Showtime series from the 1980's. The first episode is my own recording and rip because I taped it on VHS back when it first aired. The other 15 episodes are ones I found online years ago but don't recall where (so thanks to whomever the original ripper was for getting them uploaded). The quality isn't that great, but not totally bad, and will have to do unless someone somewhere comes up with higher quality rips of the entire series (or it gets released on DVD, which is doubtful IMHO). The screenshots here each represent just one episode...judge for yourself whether you want to download these or not. These are not the original rips...I had burned them to DVD and had to re-rip from the discs I had. I also managed to figure out the episode numbers and episode titles based on the guest starring credits on each episode (and that's assuming the information on IMDB was correct).